Well, for a couple of years there’s been a #WeAreNotWaiting movement among patients with some diseases who can see a way to use their digital information to, perhaps, improve their health even if industry can’t get results. Here’s an 11 minute introductory video – I won’t say more, I’ll just ask you to click and watch it. It works. 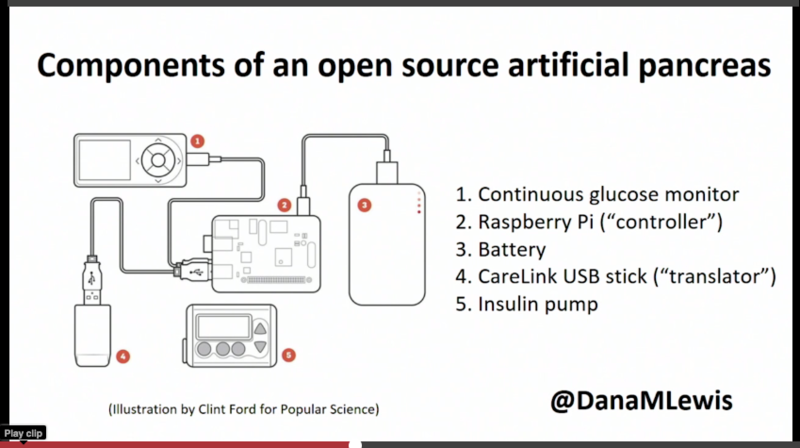 They call it the Automated Pancreas System, and they donated the code to open source, at OpenAPS.org. And now scores of people are doing it. It’s been in the mass media (Wall Street Journal, and Popular Science! even published a diagram, below), and trust me, you’ll hear more about it. This is an existential threat to everyone who believes that patients can’t possibly understand all the complex things needed to manage a disease like this … but as you’ll also hear, it’s profoundly liberating to the people who have the problem. Next up: This week in San Diego, at the Quantified Self Public Health Symposium, six members of our Society for Participatory Medicine saw Dana lead a 45 minute session with eight other users on stage. It was beyond amazing, because everything they said was scientifically rigorous – an irrefutable. Another post with video of that event will come shortly.